I wanted to write this post a couple of days ago but needed more time to dig info. If you don't read local paper The News Straits Times, probably you've missed a couple of articles about bringing a WTA women's tennis event to Kuala Lumpur. 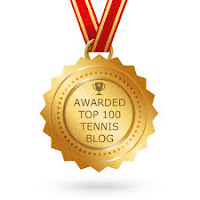 The first article was published in September but I first read about it in tennisforum.com. The initial plan was this: a makeshift tennis stadium to be erected at the Twin Towers' open car park specially for the event. Very ambitious indeed! And I was super excited! 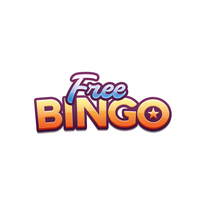 Now this event was said to be a US$400,000 event and expected to play in the second half of the year 2009. Okay, that was the first article. Then there was this second article three months later in December 2008 saying that the Malaysian Open will be held on Feb 23 to March 1. And this time the venue was: a makeshift tennis stadium to be erected at the Bukit Kiara Equestrian Club (BKEC) in Hartamas! The article said the organiser was trying to raise the total prize money from USS225,000 to US$400,000 to attract top names for the hard court tournament. Some of the names mentioned including Jelena Jankovic and Ana Ivanovic! Now the event is cancelled. There are no proper explanation or statement from the organiser or LTAM to the media. Probably because this event is still considered to be in a planning stage and it's not a responsibility to explain what had happened or gone wrong. From what my source told me, the organiser here is Carbon Group, who has the reputation of managing events like A1GP Malaysia and other motor sports and golf events. I don't really mind their lack of experience in managing tennis events because you can always engage with the experts from overseas particularly from our neighbouring countries who organise WTA or ATP events every year. Besides Malaysia has organised tennis exhibitions twice that featured tennis players like Rafael Nadal and Roger Federer as well as legends like Pete Sampras and Bjorn Borg. Although the tennis exhos were organised by different company, you have seen how they worked, roped in sponsors and made it happened. And not forgetting, Malaysia has organised WTA tournaments back in 1999 and 2000 before it was moved to Bali. Now what surprises me is that the article stated this: "The local organiser managed to outbid 16 other countries for the WTA Tour event about a month (in November?) ago." How can you outbid other countries when you know you don't even have enough of the money? Did the organiser realise the consequences of doing this? And do they ever think they can organise a huge event like this in just 2-3 months? And why not make the National Tennis Centre the main venue? This place has been used for ITF Futures and Challenger events! I believe earlier booking and renovation to upgrade the place would be sufficient to turn this place into an international tennis tournament venue. Supposed 2 weeks from now tennis fans would be able to watch a women's tennis event in Malaysia. And looking at Jelena's schedule, she's free during that Feb 23-March 1 week. She could have travelled here! Now I wonder if there's any chance for other local organisers to bid for a WTA event like this in the future because of the failure of Carbon Group to put up the show here. It's disappointing because Maria Sharapova still not back on court yet. In the latest development, the tennis beauty pulled out from playing in Paris and Dubai. But thankfully Sharapova never disappear from the scene. Fresh from her website, Sharapova talked about having fun at the Sony Ericsson photo shoot. 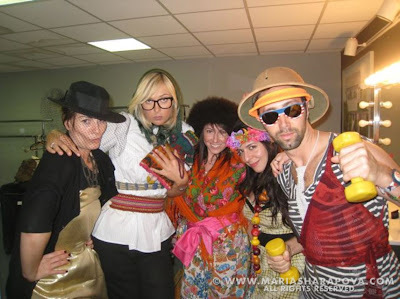 Together with her make up artist, stylist and hairstylist, Sharapova and her team put on some silly outfits and posed in front of the camera for fans viewing pleasure. Sharapova confessed those dorky glasses belong to her! 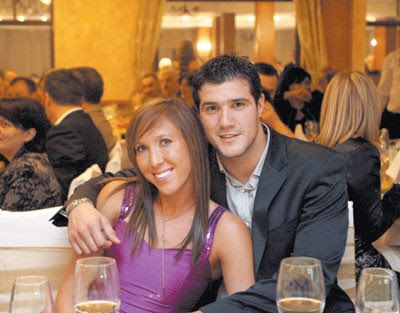 Sina Sports today reported that Jelena Jankovic and boyfriend water polo player Mladjan Janovic are preparing for their 'secret' wedding scheduled in summer. However the article did not state clearly whether if it's this year or 2010. Jelena won't go wrong in a wedding dress on her big day. I hope. Another article on Blic Online also mentioned about the wedding rumour. Jelena has denied it though. “I’m still young to get married!" "My career is still in the first place in my life and I want to devote myself to it. Of course I want to have a family one day, but not for now,” said Jelena yesterday to the Belgrade journalists at the Fed Cup press conference. Mladjan Janovic has also denied the wedding plans. “Jelena and I love each other, but it is still too early for marriage." "When I decide to get married, I will first tell my family and friends, not the whole world,” Mladjan said. Jarmila Gajdosova, a Slovak pro tennis player who now plays for Australia, was married last weekend in Albury to Australian no.9 Samuel Groth. Guess what is their wedding theme? Of course it's a tennis-themed wedding. “It was good; it was fun. I think we’re actually a pretty good match on the court as well”, said the new bride Gajdosova. The duo have been together since 2007 when they met at the Australian Institute of Sport for training. They’ve been together ever since and have even formed an on-court partnership, playing in the mixed doubles event at the Australian Open for the last two years. However there is little time for the 21-year-old newlyweds to honeymoon as they are both off to different events. Jarmila will play in a tournament in Pattaya while Sam travels to Spain for training. Now, whose wedding is next? Yeps, all eyes on Andy Roddick and Brooklyn Decker! BBC has fired Carol Thatcher, the daughter of former prime minister Margaret 'Iron Lady' Thatcher, from one of its shows after she referred a 'tennis player' as "golliwog" off-air. Although a "golliwog" is a character found in 19th century children's literature inspired by a black-faced rag doll, the term is widely interpreted as racist. 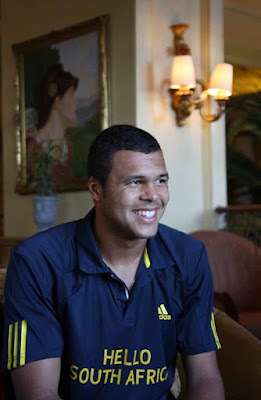 A BBC spokesperson said there was a discussion about the Australian Open in the 'green room', and Carol referred one of the black tennis players (supposedly Jo-Wilfried Tsonga) as a golliwog. 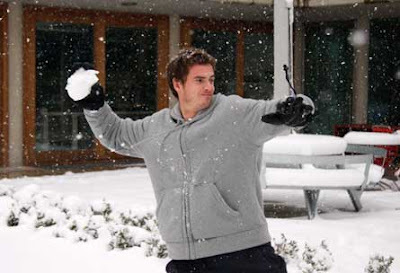 Well, Carol should have targeted Andy Murray during his bad hair days instead. 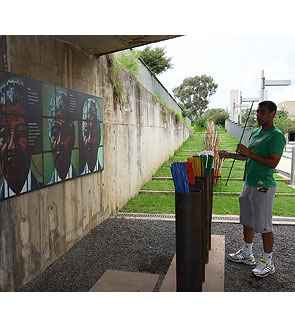 Marcos Baghdatis had the opportunity to visit the Apartheid Museum in Johannesburg on Tuesday to understand the history of South African and the legacy created by Nelson Mandela. Baghdatis and his team were all labelled as either white or non-white prior to entering the museum and forced to enter through separate doorways. “It’s weird you know, knowing that they separated people for everything." 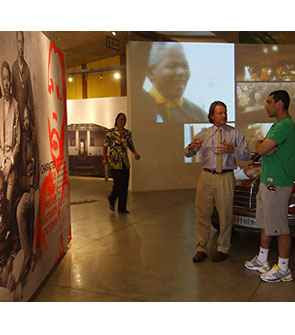 Then he was taken through a visual and physical explanation of the life of Nelson Mandala. “I can understand now why he is a hero to so many people." "The guy is an amazing person and whatever he wanted to and whatever he wanted to help those people he did it even if it meant death for him." "He spent 30 years of his life in prison and he suffered a lot to maintain what he maintains today, and I have a lot of respect for him." 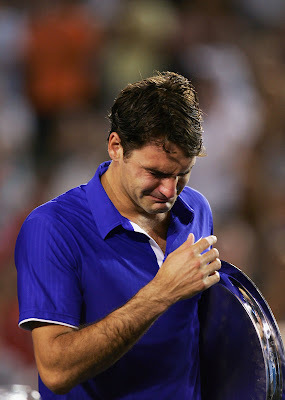 "I can understand now why people see him as a hero,” Baghdatis remarked. 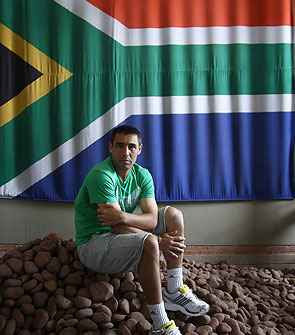 During the tour Baghdatis was also asked to take the walk of freedom, an experience that saw him choose a series of coloured sticks which represent various characteristics of Nelson Mandela’s life. Reflecting on his choice of sticks Baghdatis said “I chose loyalty because it’s always important to have loyalty to everything in life, courage I chose because showing courage is when you get the best out of you, and forgiveness because we have to forgive people that made mistakes and give them a second chance to make everything right for all the people that live this life and to leave a legacy that will not allow people to suffer like other people have”. Finally the tour ended with Baghdatis signing the museum’s visitor book, the same book which Mandela signed when the museum opened in 2001. Meanwhile at the SA Tennis Open, Baghdatis eased into the quarterfinals and he will meet David Ferrer. Sania Mirza is never far from controversies, isn't she? After winning a Grand Slam with Mahesh Bhupathi last week, she announced earlier today that she had to skip India’s Fed Cup campaign this week. She blamed it on her abdominal pain, apart from the fatigue following the Australian Open. Her absence has left India with just three players for the event, which features eight nations, split into two groups, in round robin ties including two singles matches and a doubles clash, over three days before the top side from each division meets in Saturday's final. The Indian team is world no.377 Abkita Bhambri, Sanaa Bhambri (478) and Rushmi Chakravarthi (509). The winner of Saturday's final advances to the World Group II play-offs in April. The other nations in the Asia-Oceania play-offs are Australia, Thailand, Taiwan, Uzbekistan, Indonesia and Korea. Meanwhile, Sania sounded upset with Bhupathi for not taking her to watch 'Slumdog Millionaire'. Sania wanted to watch the much-acclaimed film, but instead of taking her along, Bhupathi and Rohan Bopanna went ahead and saw the movie. “Mahesh and Rohan ditched me,” Sania said. 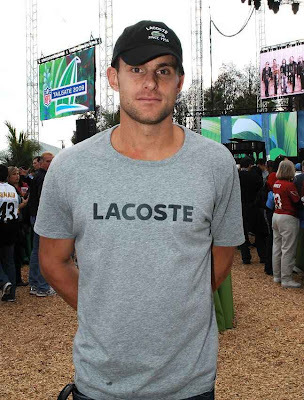 Andy Roddick and girlfriend Brooklyn Decker were at the backstage VIP tailgate. They posed separately during the pre-game show prior to the start of Super Bowl XLIII. And a reminder, guys, their wedding which is due this spring is just around the corner! Newly crowned Australian Open champion Rafael Nadal arrived at the Son Sant Joan airport near Palma de Mallorca, on the Spanish Balearic Island of Mallorca, yesterday. The situation was chaotic as the fans broke into a frenzy. I wonder what kinda homecoming celebration Nadal is going to get from his girlfriend, family, friends and management now that he's back home. Fan #1. Nadal the ladies' man. Fan #2 Even the guys love Nadal. Fan #3. 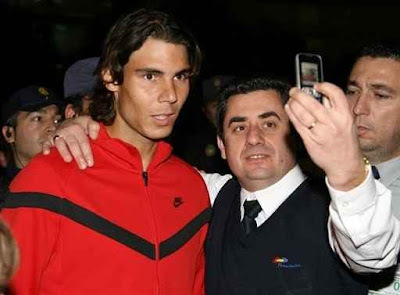 Nadal has no problem taking a picture with a pretty fan. Taiwan's team without Rendy Lu. Taiwan's top tennis player Rendy Lu Yen-Hsun, who reached a career-high 58 in the world rankings on Monday following a breakthrough performance at the Australian Open, will miss this weekend's Davis Cup tie against Kazakhstan because of an inflamed knee. The announcement came as Taiwan's team for the Feb. 6-8 tie at Sinjhuang Gymnasium in Taipei County was introduced Tuesday. Rendy suffered discomfort to his right knee during his stunning five-set upset of 10th seed David Nalbandian in the second round of the Australian Open, and further aggravated it last week during a Challenger series event in Heilbronn, Germany. Doctors there suggested that Rendy remain in Germany to treat the knee rather than play in Taiwan’s 2009 Davis Cup opener to prevent the inflammation from growing worse and jeopardizing his participation in upcoming ATP Tour events. 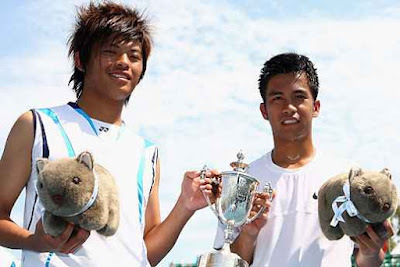 Rendy will be missed against Kazakhstan, whose top three players -- Andrey Golubev, Mikhail Kukushkin and Yuri Schukin, all ranked in the world's top 200 -- played for Russia before changing their nationalities last year. 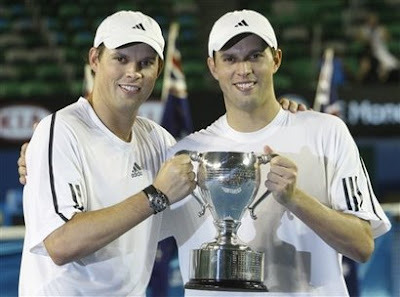 The Feb. 6-8 tie was made necessary because the Davis Cup Asia/Oceania Zone Group 1 has nine teams entered this year. Taiwan and Kazakhstan were drawn to compete for the final spot in the official eight team draw, which begins competition in earnest March 6-8. If Taiwan beats Kazakhstan this weekend, it will host India in March. A win over India and either Australia or Thailand in May would send Taiwan to the elusive World Group playoffs for the first time ever, a prospect Rendy would surely relish. The oft-injured 25-year-old risked playing in Germany to try and cover ranking points he was about to lose, but the gamble did not pay off when the knee acted up during a second round 6-2, 6-0 loss to Karol Beck of Slovakia, said Thomas Lu Wei-Ru, Lu's older brother who helps manage his younger brother's affairs. Not treating the injury now could have financial consequences. 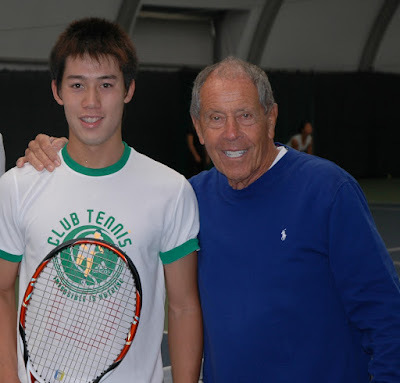 Rendy has already signed up to play at four ATP tournaments in the U.S. beginning Feb. 9, but will be fined by tennis’ organizing body, the ATP if he misses more than one of them due to injury, Rendy Wei-ru told the Central News Agency. In Rendy's absence, Taiwan will likely depend on Wang Yeu-tzuoo and Chen Ti in the four singles matches played on Friday and Sunday. A pivotal doubles is played Saturday. Wang, ranked as high as 85th in the world in 2006, is hoping to restart his career this weekend after being sidelined for most of 2008 with an assortment of ailments, the most serious a persistent wrist injury. He has played in only five ATP Tour event qualifying tournaments since last year’s Australian Open, winning just one set in the five appearances. Wang told the Central News Agency he spent most of 2008 conditioning his body and had only begun hitting balls in earnest at the end of November. 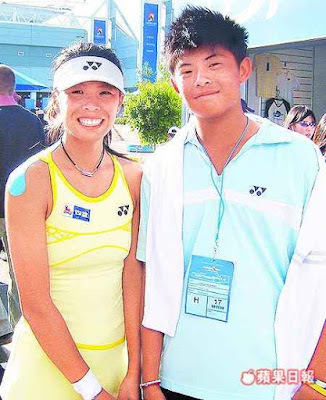 Wang, whose natural talent was in evidence when he reached the finals of the US Open boys singles at the age of 16 in 2001, felt he had recovered his basic skills and was physically fit. 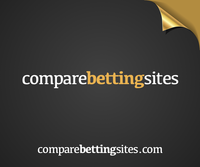 “But confidence can only come from tournaments. There's no way you can get confidence from just practicing, It's not possible," said Wang, whose confidence and match toughness are likely to be challenged against Kazakhstan. Chen Ti, who has remade his game, from his grip to his serve, in the last six weeks, will be testing how much he's absorbed. Although the world No. 375 Chen is ranked below Kazakhstan's top three players, he said he was more confident than when he played Australia's Lleyton Hewitt in a Davis Cup tie last February. "Last year when I played Hewitt, I was just hoping to play well." "This year, I'm playing to win." New ANTA gears for Jelena Jankovic's coach please! Apparently Schorsch, a poster in TennisForum.com spotted Jelena Jankovic's coach Ricardo Sanchez in his old Reebok shirt. Jelena or someone at ANTA should get him and the rest of the team some new clothes. 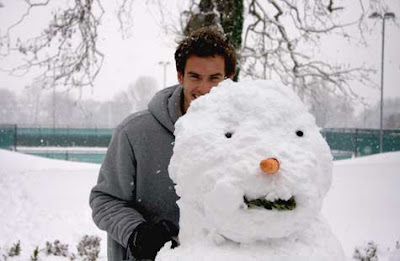 MIllions of people and children got the chance to chill out yesterday as snow blanketed Britain. 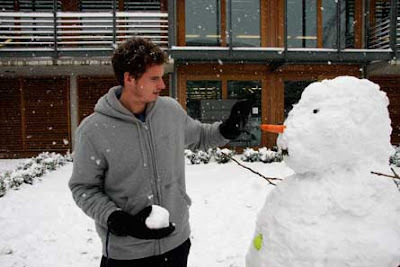 Among them was Andy Murray who was back from playing in blazing heat in Australia — cooled off as he larked in the snow in South West London yesterday. He was supposed in for training but ended up being a snow assassin. Rafael Nadal on Monday stood up for US swimmer Michael Phelps, who apologised after being photographed with a pipe usually used for marijuana consumption. "It does not portray the best possible image, but everyone can have a slip-up. 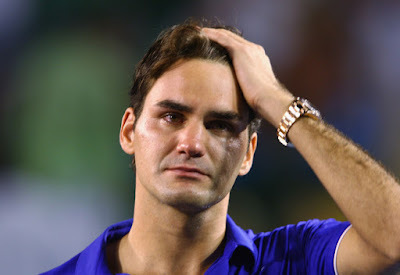 In the end sportsmen are just not machines," tennis world number one Nadal said. "Everyone is free to do whatever they want." A photograph of Phelps was published in an English tabloid on the weekend that showed the swimmer using a long glass pipe. The photograph was allegedly taken at a party in South Carolina. 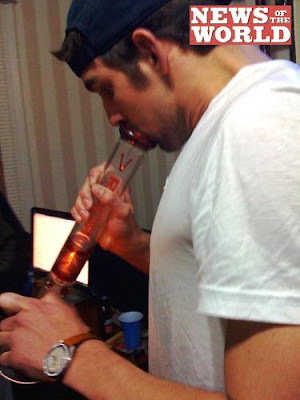 Phelps admitted that he was the person in the photograph, but did not admit to smoking marijuana, nor did he say whether there was any marijuana in the pipe. 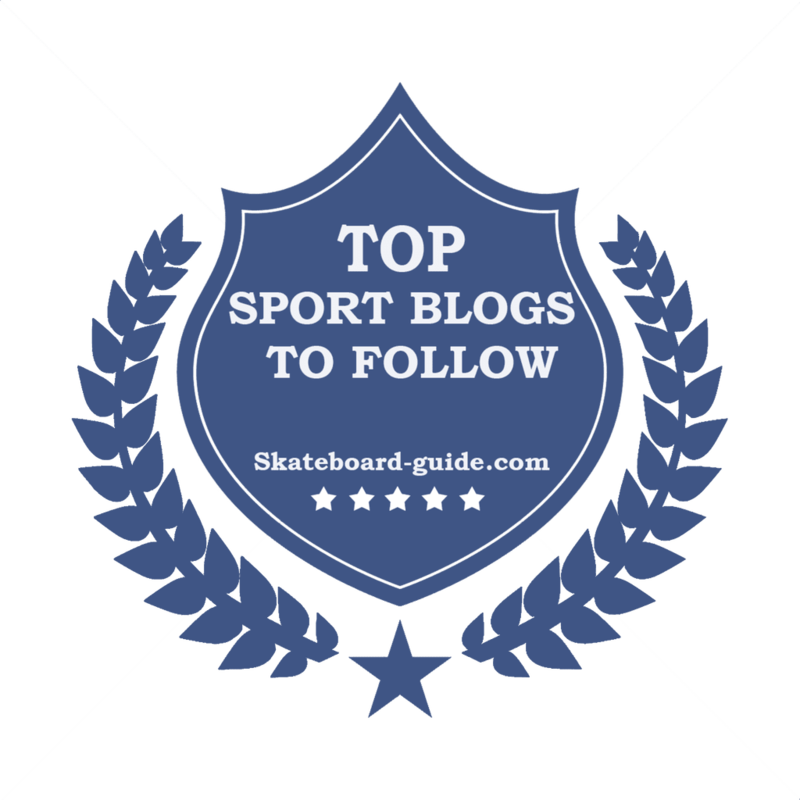 Although not considered a performance enhancing drug, marijuana is on the list of prohibited substances and several sportsmen and women have been banned for use of marijuana. Phelps, who has won 14 Olympic gold medals during his ongoing career - six in Athens 2004 and eight in Beijing 2008, - said in a statement that his behaviour "was regrettable and demonstrated bad judgment." "He has been on holiday for some time," Nadal said of fellow-Olympic champion Phelps. "He has attained all his goals and he is taking a sabbatical leave and he is totally free to be able to do it. He will have plenty of time to get back and prepare for the coming Games." Nadal and Phelps professed mutual admiration during the Beijing Olympics and even met briefly and had photographs taken together. 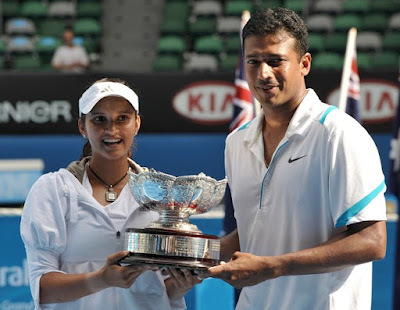 Australian Open boys champion Yuki Bhambri and mixed doubles champion Mahesh Bhupathi and Sania Mirza returned to India yesterday. The Indira Gandhi International airport in New Delhi and the Chatrapati Shivaji International airport in Mumbai welcomed the nation's tennis stars with a heroes welcome. Sania Mirza and Mahesh Bhupathi returned to Mumbai today amidst an arousing welcome, where fans of the duo cheered the Australian Open mixed doubles champs. The pair received a grand reception (although Bupathi said he wasn't feeling comfortable about big reception like this) after their successful stint down under and the two expressed relief and joy on arrival. It was a moment of rejoice for the Bhambri family, who were present at the IGI airport. Huge banners announced Yuki's homecoming as thousands were wating patiently for their hero. Yuki was received by the All India Tennis Association officials and greeted with garlands. The young champ just smiled to the waiting mediapersons and shutterbugs. Yuki is also seen here with his mother Indu Bhambri as he comes out of his residence in New Delhi to talk to journalists. Finally Rafael Nadal is at rest in Melbourne posing with the Norman Brookes Challenge Cup following his victory at the men's singles at the Australian Open 2009. When asked why does he need to fight that much with a racket in hand, Nadal said, "I love the competition, not only in tennis." "I love the competition in all aspects of life. When I compete, I love to be there and fight for the win." "Maybe," he said, after a pause, "I like more fighting to win than win." Rafael Nadal also called on tennis officials to be mindful of the physical toll the hard surface takes on players in an ever expanding schedule. “This calendar I am playing with this surface—hard court surface—is tougher than grass or clay for the body, and all the time we are playing more on this surface,” said Nadal. “In my humble opinion, we have to change that a bit more." 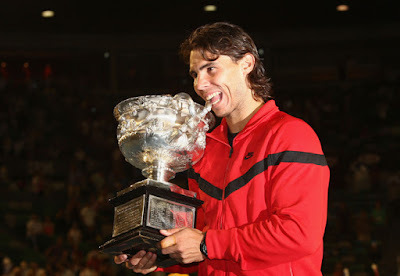 Nadal, 22, has previously won four Grand Slams on the French Open clay courts, as well as Wimbledon on grass last year. Top-seed Yuki Bhambri became India's first Australian Open boys champion after breezing past Alexandros-Ferdinandos Georgoudas in just 57 minutes to win 6-3, 6-1. 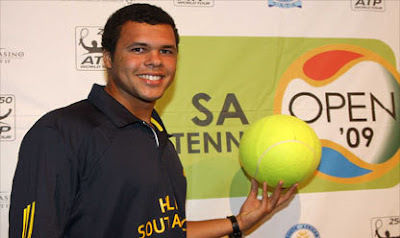 His previous best junior grand slam performance came at last year's Australian Open, when he lost in a semi-final to Bernard Tomic, who went on to win the event. 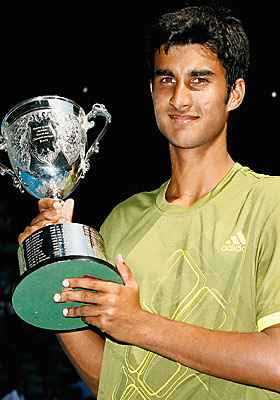 "Winning the Australian Open is obviously a very big achievement, regardless of being the first Indian," Bhambri said. "I dreamed of winning it, and it's come true." The Nick Bollettieri Tennis Academy's student said one of the toughest aspects of the match had been overcoming his nerves about playing on Rod Laver Arena. "I was actually quite nervous in the beginning . 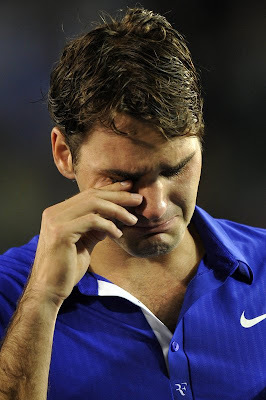 . . the first time actually playing on such a huge stadium," he said. "You don't (normally) get opportunities like this to play. As the game and match progressed I felt much more comfortable over there." In the boys' doubles final, the Philippines' Francis Casey Alcantara and Taiwan's Hsieh Cheng-Peng combined to down Russian Mikhal Biryukov and Japan's Yasutaka Uchiyama 6-4, 6-2. 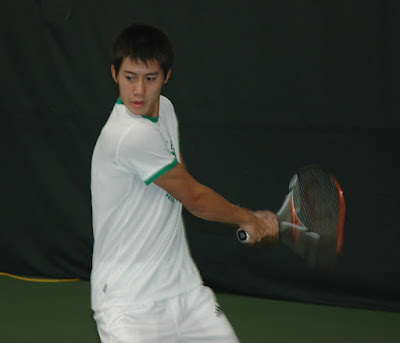 If you think Cheng-Peng looks familiar, he is the little brother of Hsieh Su-Wei.